Maybe Vice did it to score a few more points with the Peabody committee before going buckwild with homemade fusion bombs later this year, but there’s noticeable maturation in its fourth special episode devoted to a single feature topic. This time, it’s an overview of the key decisions and oversights made by the U.S. after the fateful invasion of Iraq in 2003, and an inquiry into the different factions holding back the so-called Islamic State from further metastasizing across the Middle East in present day. Correspondent Ben Anderson goes on location to the unofficial borders separating the apocalyptic death cult’s caliphate and the surrounding civilian populations trying to flee or hold their ground. 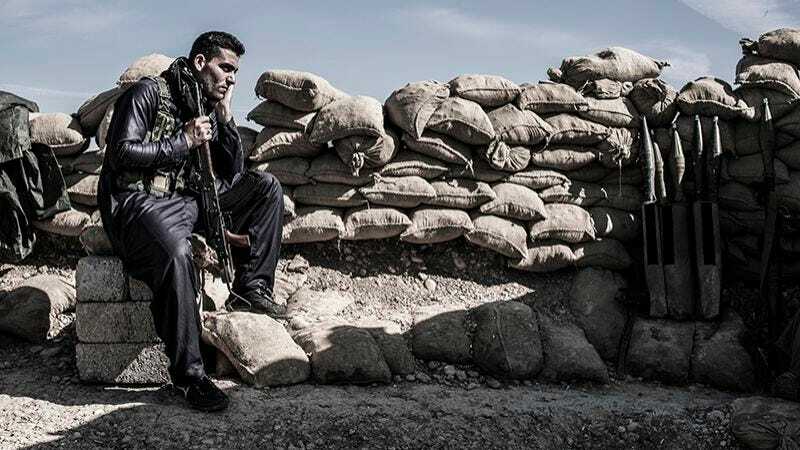 In each sectarian region, as well as on a Russian military base in Syria, he interviews Peshmerga fighting for a free Kurdistan, the abandoned remains of the Sons Of Iraq, Yazidi families, Shiite Iranian-backed militants, and captured ISIS jihadis. Other than a few dashes away from locations too exposed to sniper fire, there’s a refreshing lack of emphasis on how dangerous or supposedly unconventional the journalism is—or, for that matter, much about Anderson personally or his travels at all. The episode effectively keeps the focus on his interview subjects and their stories, as well as a totally serviceable—albeit quick and dirty—timeline from “Mission Accomplished” to De-Ba’athification to the 2010 election to the lose-lose-lose situation today. As an added small bonus, Anderson’s matter-of-fact tone and dialect is a nice voice-over relief from Shane Smith, whose—how do I put this in a way that doesn’t sound anti-Canadian?—second-halves of every sentence sound like he’s reading the very end of a great novel. The situation is, it turns out, a hell of a lot more complicated than it sounds on the presidential campaign trail, where “seeing if sand can glow” appeals to some as a sane, not-at-all-genocidal option. For all the bluster and lip service from candidates about “no-fly zones,” “safe zones,” and grand but never solidified coalitions, once you get into the specifics, there’s not much to distinguish either party’s positions from the “strategic patience” President Obama has in effect now. Unlike in Fixing The System, where increasing bipartisan support for justice reform measures allowed for a clear call-to-action by the end of the documentary, the Islamic State comes with no obvious answers. Anderson instead tries to establish the facts and point out the catch-22s in order to facilitate a debate. 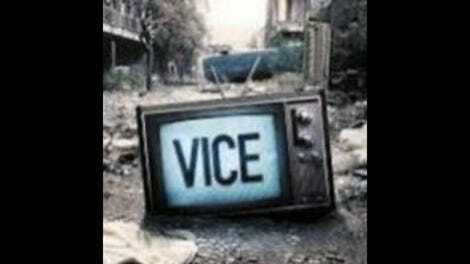 Vice prides itself in visceral storytelling, and in that, it greatly succeeds. In one Orwellian scene, a soldier in Anbar Province shows off the welded and jerry-rigged weapons he and his soldiers use, then traces their ownership back and forth between them, the U.S., and the old Iraqi Army. The episode is smart enough to counter seemingly obvious solutions with hindsight and perspective. Why not just arm more rebel groups? Because that’s part of the reason why the region is so flooded with advanced weapons to begin with. A conversation with Russian Prime Minister Dmitry Medvedev, in which “terrorist” is tossed around seemingly without any attempt to clarify Islamic State versus rebels fighting Bashar Al-Assad (not mentioned once until 40 minutes in), is especially head-scratching. Even compared to the other juggernaut issues Vice has tackled in feature episodes (federal prison reform, cancer, AIDS), war storytellers face exceptional challenges to crafting comprehensible narratives pieced together from disputed accounts, decades of developments, and the motivations of millions of people. Sure, an hour is a short amount of time to recap more than a decade’s worth of bad Middle Eastern policies, but PBS has successfully done it twice already, and found a way to do it without coming under gunfire. Even Vice’s HBO Sunday-buddy Last Week Tonight With John Oliver manages to regularly boil down the highlights of massively dense issues like the American CIA torture program into brilliantly crafted 10-minute synopses. With that in mind, the emphasis is still on magazine in HBO’s newsmagazine, and there’s plenty of valuable, unique footage that helps emotionally translate a dire situation into something recognizable. For viewers looking for a primer on the issue, it’s not a bad place to start.